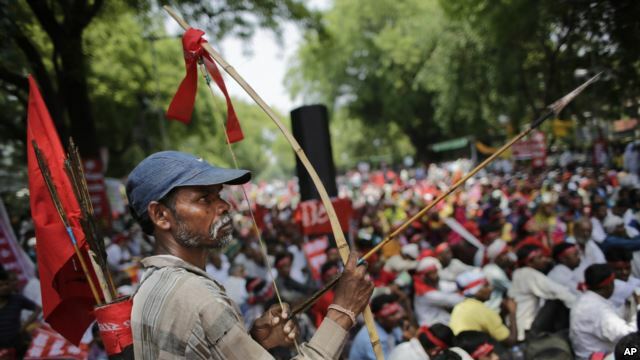 In the first direct blow to his ambitious economic reform agenda, Indian Prime Minister Narendra Modi's government has had to row back on a business-friendly land bill amid fierce parliamentary opposition. The government has not given up on making it easier to acquire land needed to kick-start hundreds of billions of dollars in stalled projects, but after failing to win support in parliament may ask states to pass their own laws. "We realize that currently we don't have the numbers to pass it," a leader in Modi's ruling party told Reuters. "By reducing the heat on this we will be able to get other things passed." After sweeping to power last year on expectations he would accelerate an economic transformation that began in the 1990s, Modi is struggling to build support in parliament, where his party is in the minority in the upper house. Having staked so much capital on an unpopular issue, Modi risks losing the initiative to the opposition and fuelling perceptions that his reform plans are not necessarily going to improve the lot of India's 1.27 billion people. "This is a huge setback for Modi," said Sanjay Kumar, an analyst at the Centre for the Study of Developing Societies. "This is an indication that if bills are controversial, this government is going to find it very difficult to pass them." In the next sitting of parliament, due to start on Tuesday, the government wants to ease the passage of the biggest overhaul of taxes since independence in 1947, and may also introduce the first major labor reforms in decades. Modi's Bharatiya Janata Party (BJP) will have to fend off opposition attacks in the rowdy houses over allegations of corruption, and does not want to rile opponents further over the land law. Land reform is critical for Modi's drive to build new roads, homes and factories and, if stalled, would blight his vision of 100 new "smart" cities across India linked by industrial corridors and high-speed rail routes criss-crossing the country. In the last seven months, Modi has had to issue temporary executive orders that allow the government to forcibly purchase farmland for industrial development, but has failed to secure the votes in parliament to make the changes permanent. Senior BJP leader Shrikant Sharma told Reuters the government would continue to work with opposition parties to pass the law, but if that failed, it would work with individual states to implement their own versions of the legislation. "The opposition can't stop our agenda, it can only delay it," he said, in comments echoed by a senior cabinet minister. Eight states where the BJP is the largest party could press ahead with passing their own laws, but that would risk creating a patchwork of regulations that could further hold up stalled infrastructure projects worth $300 billion. Opposition parties have joined forces to portray the proposed changes to the land act, including exemption from getting consent of 80 percent of landowners for some projects, as anti-farmer, a damaging charge in a mostly rural country. On Wednesday, opposition leaders boycotted Modi's latest attempt to build consensus around the issue. "I certainly hope that the reality dawns on them. The whole country is against this bill," said Jyotiraditya Scindia, a leader in the Congress party that has spearheaded opposition to the reform. In a sign the government is delaying a push on the bill, four senior government officials on Thursday failed to appear before a joint parliamentary committee examining the proposed changes to the law, and their report will now be delayed by two weeks, according to a member of the panel. That would effectively rule out progress on land policy during the three-week "monsoon" session of parliament. "It is now almost clear that there would be no consensus on the amendments," the person said, asking not to be named. "Members have taken a line almost identical to their party stands. There is no scope for reaching a common ground."